The Prime Minister of Malaysia, Honorable Dato Sri Mohammad Najib Tun Haji Abdul Razak, personally welcomed almost 1800 participants of the International Seminar on Autism, Malaysia 2014 in Putra Jaya International Convention Center (PICC) in Malaysia last 22-23 April 2014. The delegates comprised of six First Ladies, 200 international delegates from 35 nations, and more than 1,000 local delegates representing various sectors of society -- mainly parents, educators, professionals and advocates. The Honorable Prime Minister shares his hope that the seminar raises awareness on autism and inspires citizens of the world to formulate action within their communities. By sharing Malaysia’s local expertise on autism with regional neighbors and global counterpart, he hopes the lives of children with autism and their families throughout the world will improve. He also believes that compassion and consideration alone are not enough to address the situation. Action is needed to tackle the issues faced by children with autism and their families. Her Excellency Datin Sri Rosmah Mansour, wife of the Prime Minister and the patron of ISOM, collaborated with PERMATA, Autism Speaks, and University of Kebangsaan Malaysia to organize the conference with the support of the Ministry of Women, Family and Community Development and the Ministry of Education. She believes that the seminar is timely because the sheer magnitude of ignorance towards autism is alarming and failing to understand the disorder will result into tragic consequences. Failing to act on the disorder will bring about lingering effects not only to the children with autism but to their families and the community. Gala Dinner hosted by the First Lady at the Official Residence of the Prime Minister. 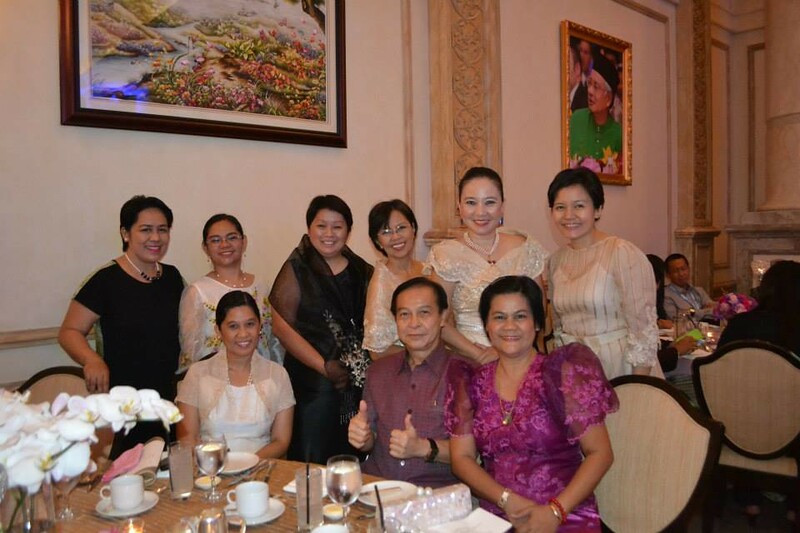 ASP delegates in their National costume -- (standing, L-R) standing, Rita Managbanag, Joy Ofrecia, Joy Capada, Trustee Cecil Sicam, Trustee Gina Bermudo, My Sorongon, (seated, L-R) Teena Derequito, Khun Samreng from Thailand, and Mayette Tan. The two-day seminar was packed with topics that addressed the current concerns and issues surrounding Autism Spectrum Disorder. Invited speakers are leading authorities in their fields. The Diagnostic and Statistics Manual of Mental Disorders V (DSM V) was thoroughly discussed and integrated into the seminar for the participants to fully understand the changes, which affects the definition, diagnosis and intervention of autism. After the welcome speeches, the seminar opened with Voices of the First Ladies; a special session where the First Ladies of Bangladesh, Morocco, Albania, Sudan, Sri Lanka and Kyrgyzstan presented a short report about the current situation of autism in their respective countries and the actions being taken to improve the existing condition. Arabic and Russian interpreters were present to aide the non-English speaking participants. The conference was divided into Plenary and Concurrent Sessions to give the participants the chance to choose a topic relevant to their needs or field of interest. Part of the conference is a panel discussion with representatives from the Ministry of Education of five different Asian countries. Officials from Malaysia, Singapore, Thailand and Brunei discussed the Different Approaches to Schooling Practice for children with ASD in their respective countries. The plenary topics included “Epidemiology of Autism Spectrum Disorders” by Associate Professor Dr. Young Shin Kim of Child Study Center, Yale University where she presented a study that showed the effects of different studies in determining the prevalence of Autism Spectrum Disorder and the effects of DSM V in diagnosing the disorder. Dr. Andy Shih, VP of Scientific Affairs of Autism Speaks discussed an ongoing research that covers a whole genome sequencing advances in autism diagnosis and personalized care including a comprehensive characterization of the genetic architecture of autism in this talk entitled “State of Autism: From Laboratory to Community – Perspective on Recent Advances in Autism Research and Future Directions”. Dr. Shih emphasized that the research is not a diagnostic tool but aids in detecting a clinically relevant variants in ASD. There were three concurrent sessions with vast array of equally interesting topics ranging from services, therapy and medical to hopefully enlighten the participants in understanding the disorder that will help them navigate the complex labyrinth of the disorder. The seminar was also used as a venue to announce the Malaysian government’s initiative to put up the first one-stop center called PERMATA Kurnia to address the issues on autism in Malaysia. PERMATA Kurnia would provide early intervention and early childhood special education to children ages 6 to 12 and will be operational in 2015. Autism Society Philippines was represented by ASP Vice-President Cecil Sicam, Trustee Gina L. Bermudo, ASP Ormoc 1 Chapter President Henrietta Managbanag, ASP San Fernando Chapter President Joyla Ofrecia, ASP Lagro Chapter President Marietta Tan, ASP members My Sorongon (National), Joy Capada (Iloilo) and Teena Marie Derequito. They were joined by Ranil Sorongon of APCD. The collaboration and partnership of the different Asian countries, bringing to realization that “Autism is not a tragedy, Ignorance is”, will help us understand better what autism is and together we will move forward and make Asia an autism-friendly place for children in the spectrum. This article is a contribution of Gina Luna-Bermudo, ASP National Trustee.